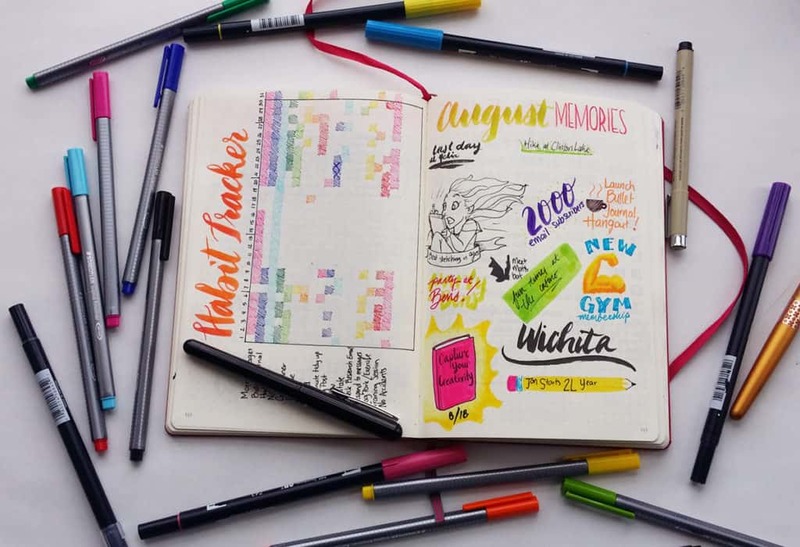 You are here: Home / Bullet Journal / My Monthly Planner – September is Finally Here! 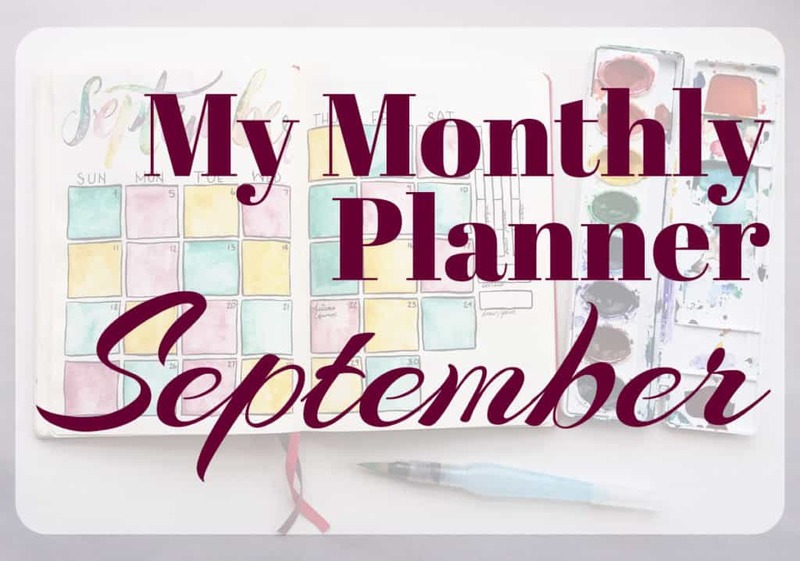 My Monthly Planner – September is Finally Here! Can you feel it? That shiny new potential that the turning of a new month brings always fills me with joy. I love starting fresh, looking at my goals and accomplishments, and moving forward. Plus, I absolutely cannot contain myself that autumn is upon us! 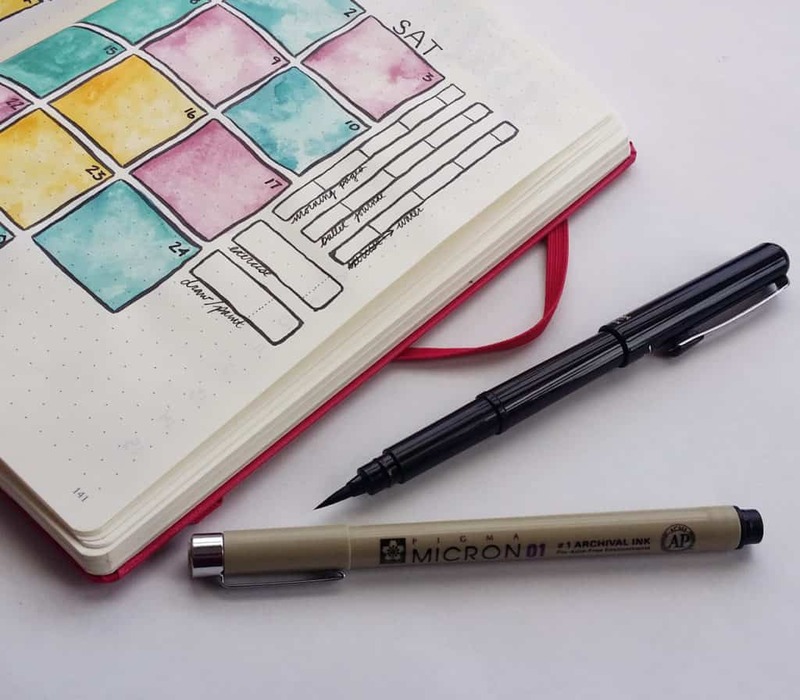 Let’s dive right in to my bullet journal, shall we? 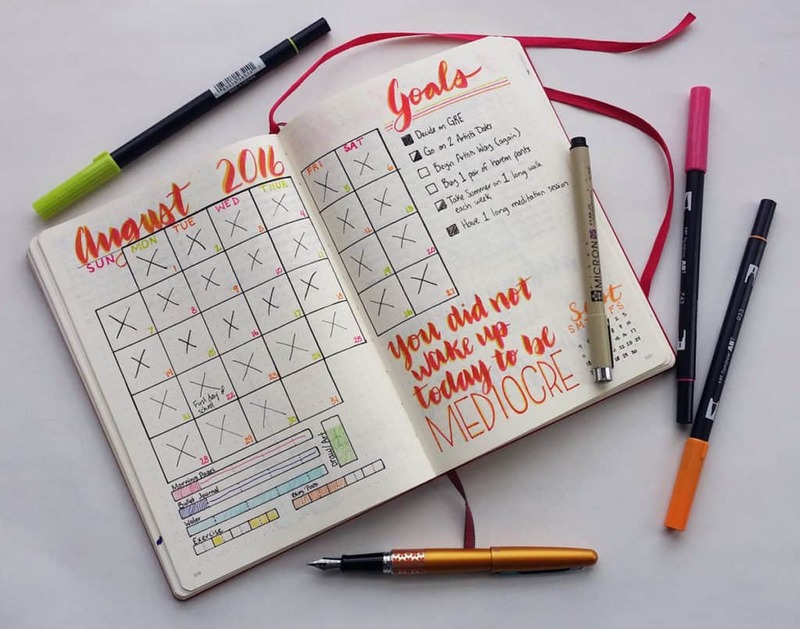 I like to show you the filled up pages from the previous month for two reasons: I want to show you how I am progressing in my goals and I want you to see that it ain’t nearly as pretty after some heavy use. Sure, the spreads may have looked nice when they were just set up, but they sure do take a beating over the course of a month. But I like that used look. It feels comfy, like shoes that you’ve broken in to fit just your feet. Here is August’s calendar and progress bars. 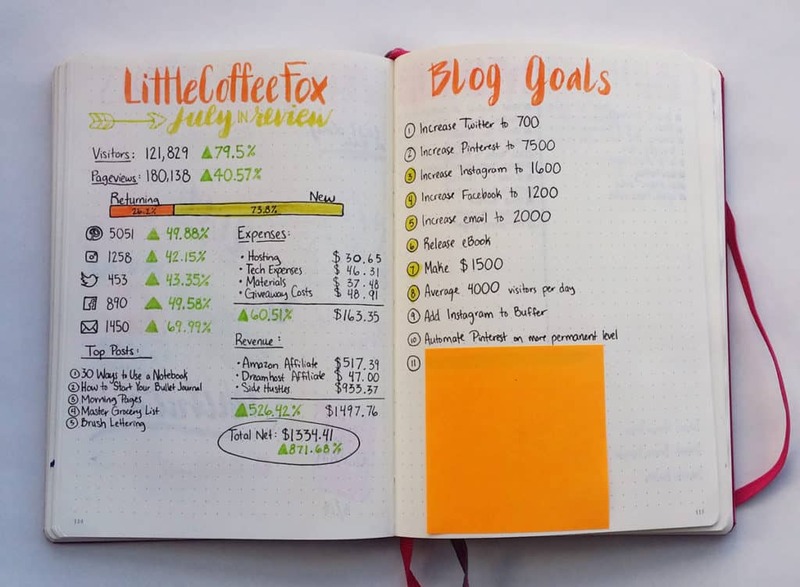 As you can see, I failed pretty miserably with my daily goals like my Morning Pages and even using my bullet journal. But I did have excellent success with two things – hydration and drawing (I had a minimum of five boxes for drawing, which I knocked out. The rest were just gravy.). Yes, our trip down to Wichita did take its toll on my daily schedules and routines, but I managed to rock out hydration. I’m really super stoked about that. I guess I just really want that lipstick that I promised myself! I haven’t done a great job with exercising, but you should see it increase in the coming month because I got a new gym membership! The student rec center here is seriously awesome, so I should be hitting my exercise quota in the coming weeks. Crossing my fingers! 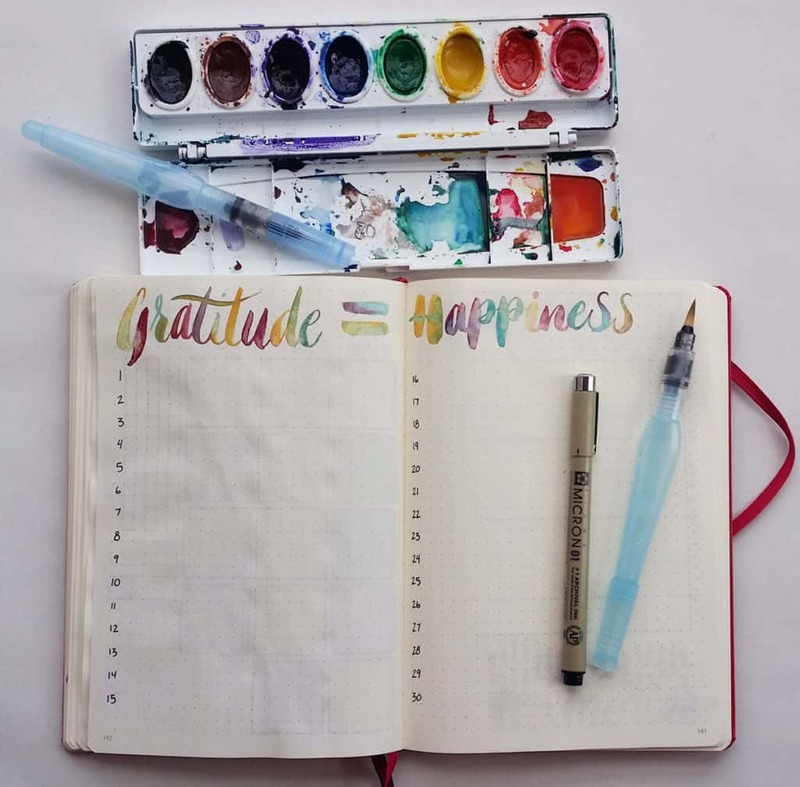 On the next page, you can see my Gratitude Log. Ah yes, it is a rather sad sight with more than a week missing from the middle. I was a bad, bad girl when it came to my daily logs and trackers during my Wichita times. 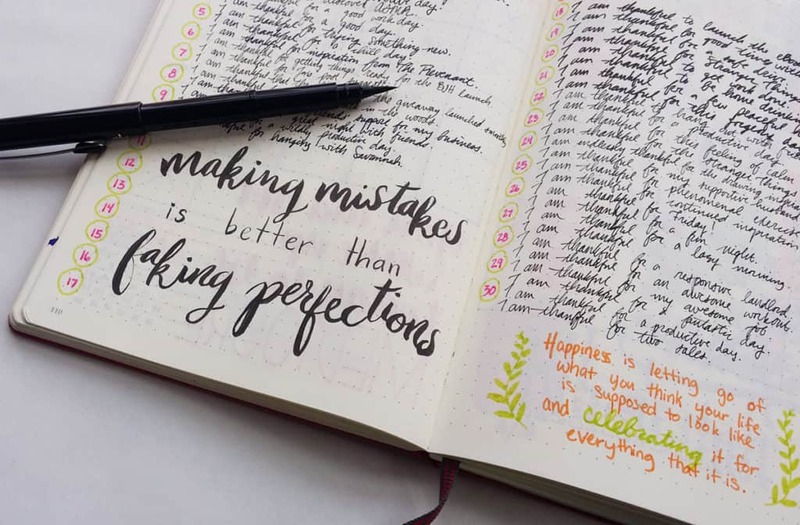 I will just have to do better in my next monthly planner! After that, you can see my Habit Tracker, which suffered the same fate. I could fill in certain things that I know for sure, but most of it is lost to the ages. My memories page got plenty of action, though! I had fun playing with my full arsenal of pens and markers. I went wild with my Tombows, Staedtlers, and Microns. Even my Pilot Metropolitan came into play when I doodled that cute little cartoon labeled “Best Sketching in Ages”. I actually used a new brush pen that I haven’t properly introduced yet, but you’ll see it soon enough 😉 Just keep reading! Plus I got to add a memory that I’m super excited about! I finally released my first product, an eBook! Last but not least is my monthly blog stats and goals. I’m pretty pleased about how the blog did this month on hitting goals. It certainly wasn’t perfect, but it was progress. I do need to get better about setting clearly definable goals, because I have lots of weird partial success for some of those ambiguous goals and I have no idea whether I succeeded. Silly me! 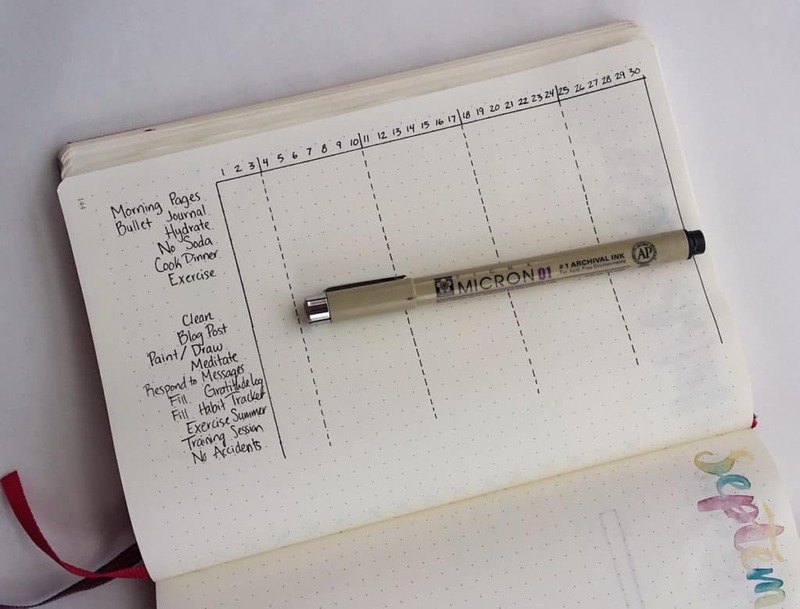 So now I unveil what is probably my favorite monthly planner I’ve ever done! Ready for this awesomeness? BOOM. I don’t mean to toot my own horn, but that is a magnificent calendar. At least it is for me. Just let me have this! 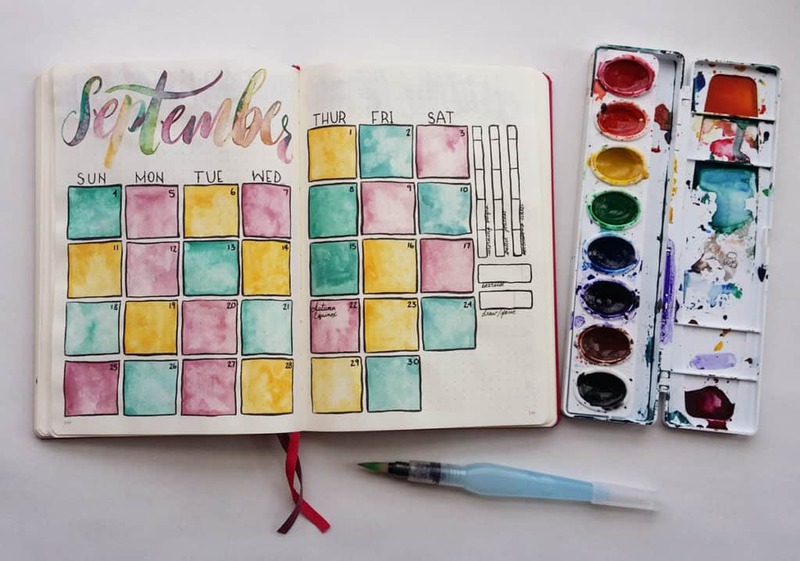 I used almost exclusively watercolors for this month’s spread. Almost. There’s always room for my Microns. But on my calendar page, besides the awesome colors and textures, you may notice a small difference. Well, a few small differences. Firstly, each day has its own independent little box, which contrasts every monthly planner I’ve ever done. It’s a really neat look, but it takes up a bit more space. I also nixed my monthly goals list! It feels crazy to do, but I realized that I hardly ever check those goals all through the month. Usually I only check them when I’m getting ready to set up my new month, and that’s just not a good system. So for now, they are gone, baby, gone! I also moved my progress bars and sorta squeezed them in on the side. It works, but it took some maneuvering. I’m pretty pleased about it, though! You may be wondering why the box lines on my calendar aren’t very straight. I actually used my new Pentel Pocket Brush Pen! It was awesome, I felt like a cartoonist. The ink is so beautifully rich and dark, and it didn’t budge at all when I applied the watercolors. I am so thrilled by this little pen. For the actual act of watercoloring, I used my Pentel Aquash Water Brush Pens and a cheap little Prang watercolor palette. I’m gonna be honest, they don’t make this exact watercolor palette anymore because this is practically an antique. It was a hand-me-down when I got it and it’s been sitting in a drawer for years and years. Regardless, the colors are phenomenal and the pigment is really rich for such a cheap product. I don’t know if I would use this palette for a proper fancy painting, but it is perfect for my bullet journal. So I’m sure you’re dying to know how the Leuchtturm1917 holds up to such a wet medium. Leuchtturm has fantastic paper, and there hasn’t been any bleed through AT ALL. I mean, yeah, the pages get wrinkly and warped (or as I like to call it “crispy”) and it does ghost a little bit. But overall, I don’t mind the negative side effects. I actually kinda like the character it gives my bullet journal. If you want to know how far you can go with watercolors, check out my bullet journal watercolor test here. I wouldn’t do any big ol’ paintings in my Leuchtturm, but spots of color here and there are fine. Granted, I did more than a few spots of color here, but my point still stands. Just make sure to have some paper towels on hand to keep it from absorbing too much and you’re golden! After my splendid calendar spread, I have my Gratitude Log. Again, I used my Water Brushes and Microns to create this little beauty. I did do a silly thing and accidentally grab a different size brush for “Happiness”, which resulted in two totally different fonts. That’s why one is long and swirly while the other is plump and cheerful. Oh well! On the next page, I have my Habit Tracker. As usual, I completely forgot to make a header. Good thing I know what this page is for! I kicked a few old things that I never filled out or used. I then added a few new things to help facilitate better blog management and me management. Please excuse my wandering justification, I don’t know what I was thinking. I left some room at the bottom for any new habits I might want to add (maybe get up before certain time?) and kept the log open ended. I like to keep my options open. 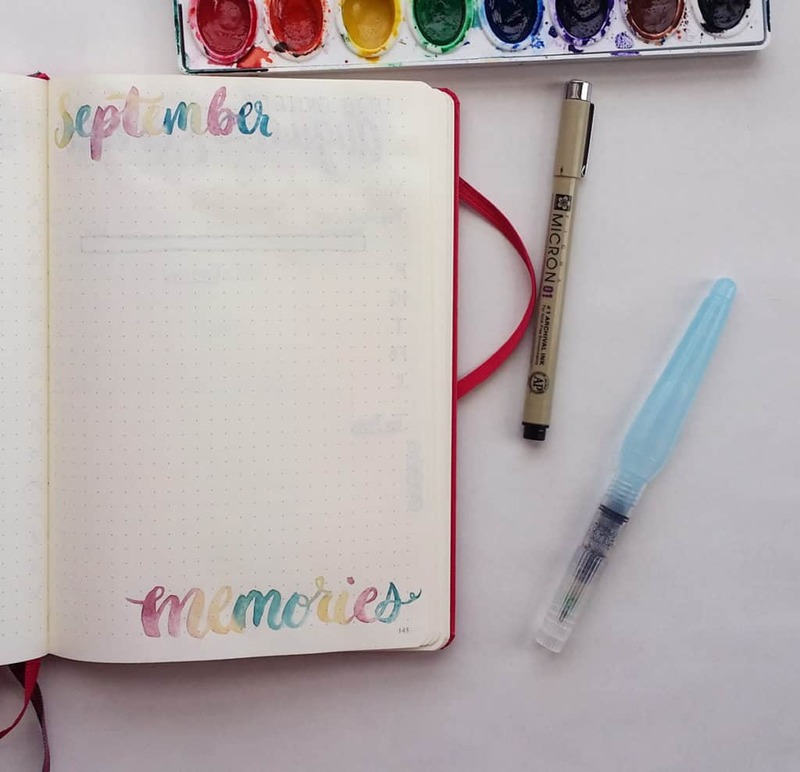 Then we have my September Memories page. I can’t wait to fill that little page up with all kinds of cool autumn stuff! Then we have my stats page for August! This was a lovely month, as usual. I didn’t grow quite as much as previous months, but the growth is still substantial and it makes me feel warm and fuzzy. My expenses went up, but that’s to be expected. After all, I have officially declared this my main income, so I don’t need to feel so shy about spending money for much needed materials. My income went up as well, which has been a huge relief. I was terrified that the first month after I quit my job was going to take a nose dive! I’m happy to say that I made the right choice. Have you had a chance to check out my top five posts? You should! They are pretty awesome. I can’t wait to tackle this month and have fun. I live for this season, so I hope that I get to be wicked productive and have plenty of romps through the leaves. Only time will tell! 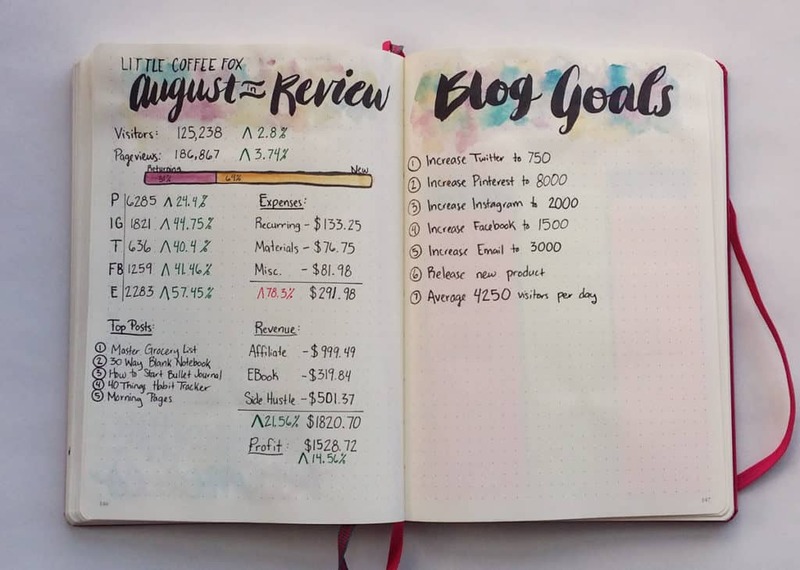 August was my first month being a full time blogger. Interested in starting your own blog? Cuz you should be. It is wonderful, stressful, magical, and chaotic. I wouldn’t trade my job in for just about anything (except maybe ice-cream sampler) and I can’t believe how lucky I am to do this for a living. You guys are the best, you know that? So what are your awesome plans for this month? How are you setting yourself up for success? Comment below and tell me! Please post a video of how you do that gorgeous watercolor lettering! The colors blend so beautifully! Thank you so much, Carol! That is a great idea! Thank you for your sweet comment! I used Pentel Aquash Water Brushes for this spread 🙂 I hope that helps! That’s for our puppy! We’ve been potty training her over the last four months and tracking her success as she gets better and better. Hopefully we won’t be needing it for much longer!